Wire bins and wire containers are a great heavier-duty alternative to corrugated boxes and plastic bins and containers. These wire bins and containers come in a variety of different dimensions and styles, and they can range in size from a few inches to ten feet or longer. The high-quality wire bins and containers sold by the S. W. Betz Company have capacities of over 6,000 pounds. Our wire bins and containers can be picked up and accessed on all four sides by standard pallet jacks, lift trucks, or fork lifts. They also have a drop gate design, which allows easy access to the products that they contain. We carry collapsible wire bins and containers for easy nesting as well as rigid-wall containers In addition to some of the products that we carry that are listed below, the S. W. Betz Company also has custom-sized wire bins and wire containers available to fit any need. The S. W. Betz Company represents and distributes product for many of the top manufacturers of wire bins and containers in the country including Nashville Wire. Nashville Wire is located in Nashville, Tennessee and has been manufacturing high quality wire bins and containers since 1934. If you are in need of or would like more information on any of our wire bins and/or containers, please contact us and one of our team members will be happy to assist you. 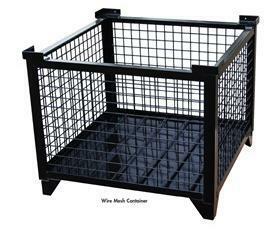 For more information about Wire Bins & Containers or any other product or service from S.W. Betz, fill out and submit the form to the right.